Greg Black joined the Miller Products team shortly after the McFarlands moved the company to Osceola, Iowa over three decades ago. He’s largely responsible for the day-to-day welding maintenance but is also instrumental in the creation of the stellar pin welding jobs Miller is well known for. Born in Osceola, Greg moved around in his earlier years, attending Murray for a while but graduating from Clarke Community Schools. After his graduation he joined the Navy and was enrolled in Navy A-school immediately following boot camp. He became a Submarine Hull Technician, graduated second in his welding class. He was offered an opportunity to go to school in San Diego where he learned the skills for nuclear power plant welding, one of only four students out of an original thirty-two to complete the program. Greg was stationed on the USS Canopus in Holy Loch, Scotland for close to two years, spending his time creating necessary pipe fittings and working in the welding shop to keep up his qualifications. Greg completed his tour with the Navy and worked in Norfolk, Virginia, joining the Miller team here in Osceola. 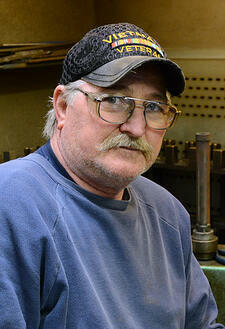 Through the years, Greg has been an integral part of the Miller Products team. He was even part of the design team that created the oil boom pins used in the BP oil spill in 2010, and he continues to make valued contributions using his attention to detail and great work ethic. Greg most recently was part of the Clarke Welding Arts Sculpture Competition, mentoring a team of students and passing his knowledge and passion for the work to the next generation. Be sure to say hello to Greg when you see him around Osceola, and join Miller Products Co. in thanking him for his decades of dedicated service. Since our beginning in 1936 as a bicycle dealer and kickstand manufacturer, we have evolved into a supplier of quality manufactured products sold throughout the US and international markets. Located just forty miles south of Des Moines, IA; Miller Products specializes in single spindle/CNC, and multi spindle screw machined parts. We sell everything from stock items to customized parts at our customers discretion. Our highly trained staff and engineers work diligently each day to meet our customers needs no matter how big or small the project happens to be.